Time spent in the bathroom can be precious, as it may be your only solo time. When prioritizing home upgrades, consider first transforming a ho-hum, conventional bathroom into an oasis of comfort, style and ultimate relaxation. Replace outdated fixtures with new top-quality options that offer greater functionality. Mansfield Plumbing produces fixtures and fittings designed to work in tandem. 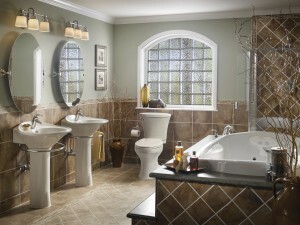 Our “suites” of a toilet, sink and bathtub can improve the look of your bathroom setting. In a toilet, there are certain features to seek. A SmartHeight toilet allows for easier access. If you’re environmentally conscious or looking for a pocketbook-friendly option, ask about a WaterSense rated toilet, signifying greater water conservation. When it comes to relaxation, the bathtub is king. Luckily, Mansfield offers innovating features that go beyond whirlpools. Ask about chromatherapy mood light systems, thermotherapy heated backrests and in-line heaters that keep water heated perfectly.